The attractive high impact casing is durable and shock resistant so you can take it anywhere, anytime even put it in your pocket and go. 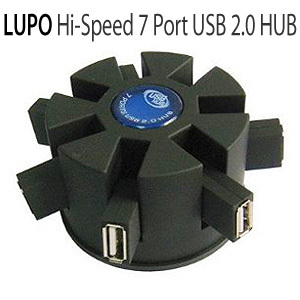 I wanted a low cost, unpowered multi port USB 2.0 hub for all the devices from my notebook since it only had three USB ports. When I plugged this in, it worked immediately without my doing anything else, and I filled all seven ports with: three flash memory sticks, scanner, printer, card reader and powered 500GB extension HDD. All of this in Linux too. All devices were recognised except the card reader (part of a external drive) and allowed me to spend my time sorting drivers in Linux for the card reader, scanner and printer. I'm printing happily now and booting Knoppix 6.2.1 from a fourth flash memory stick in a computer port. Let's not forget the USB mouse and keyboard that occupy the other computer USB port This hub was the perfect solution for that third and last USB computer port. Now, I need another hub. There are all these USB 2.0 cables for digital recorders, cameras, Freecom Digital TV, WiFi, etc. that need connecting too which I would like to leave plugged in permanently into another hub. I can experiment to see if the USB mouse and keyboard will work from the hub which they should. I can plug the hub in and out with its one connector as I choose and take it with me. Makes organisation for the home and road fascinating exploration of what can be done. It looks like a distributor cap with all pistons firing. No loose connections so far. It is a gem.